"Tom Lippman has done it again. Saudi Arabia on the Edge is a worthy successor to his classic, Inside the Mirage: America's Fragile Partnership with Saudi Arabia. Meticulously researched, this fascinating book debunks the myths and stereotypes about Saudi Arabia that pervade Western observations. The author shares with us his wisdom honed by decades of experience in Saudi Arabia. 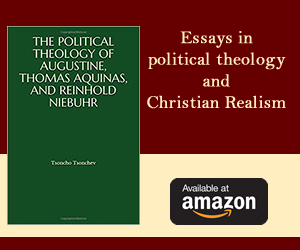 He presents a realistic and occasionally alarming picture of an economic and political giant beset by a gathering storm of challenges in a rapidly changing world. I highly recommend this thoughtful perspective." The peculiar alliance between the United States and Saudi Arabia, forged during World War II and lubricated by oil, is being reshaped by dramatic shifts in global petroleum markets. The United States now gets very little of its oil from the Middle East and is less dependent on imports as its own production increases. Saudi Arabia's most important customers are in Asia, and the kingdom's position as the world's leading exporter is eroding as its domestic consumption rises. Saudi Arabia's rulers and strategic planners in Washington still find each other useful, especially in confronting Iran, but they no longer need each other as they did in the past. It would be hard to think of two less likely partners than the United States, the world's leading industrial power and evangelist of democracy, and the Kingdom of Saudi Arabia, which at the time it granted an exclusive oil concession to Standard Oil Co. of California in 1933 was an isolated, impoverished backwater ruled by an absolute monarch. Their alliance was never about shared values; it was always about economics and international strategic imperatives. 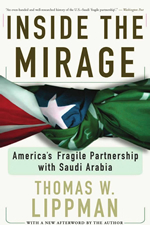 I told the story of how the alliance came about and how Americans transformed Saudi Arabia into a modern state in "Inside the Mirage: America's Fragile Partnership With Saudi Arabia," which I wrote partly in rebuttal to the hysterical volumes demonizing the Saudis and their religion that flowed from the terror attacks of September 11, 2001. In that book I showed how every aspect of life in Saudi Arabia today other than religion has been shaped by Americans: industry, public health, aviation, retailing, banking, government service, agriculture, and of course the armed forces. Now the United States is like a parent watching a son reach adulthood and strike out on his own. Saudi Arabia today, a member of the Group of 20 economically advanced nations and of the World Trade Organization, is a modernizing society confronting the same problems of urbanization, resource scarcity, human rights and economic strain as many other countries. 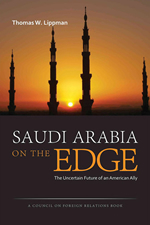 How it is trying to address these thorny subjects in a tradition-bound society where all public life is seen through a religious filter is the subject of my "Saudi Arabia on the Edge: The Uncertain Future of an American Ally." The kingdom has grand ambitions and well-developed plans for achieving them, and of course it has plenty of money. But its future is clouded by profound handicaps: a fast-growing young population, aging and isolated leadership, inefficient government services staffed by corrupt officials, an entrenched religious establishment opposed to all social and intellectual innovation, an outdated and wasteful education system, and critical shortages of water and, surprisingly, energy. This was the most surprising development I discovered as I traveled around Saudi Arabia conducting interviews for "Saudi Arabia on the Edge." The Saudis are not much concerned about running out of oil - their reserves are enough to keep pumping for decades. They are concerned about domestic energy consumption patterns that may limit the amount available for export, the source of about 85 percent of state revenue. Here in a nutshell is Saudi Arabia's problem: now a developed country, it consumes vast amounts of electricity, for air conditioning, household use, industry and the immense desalination plants that provide almost all drinking water. Because electricity and gasoline are virtually given away as part of the ruling family's effort to keep the disenfranchised citizens happy, there is no incentive to conserve. The country has committed billions to solar technology but useful production is years away. Limited supplies of natural gas have restricted the kingdom's ability to shift oil-fired power plants to this alternative fuel. The kingdom plans to build as many as sixteen nuclear power plants, but those are a decade or more in the future. As a result, the Saudis are burning more and more of their own oil to generate electricity and power their own vehicles. The scope of this problem entered public discourse in the United States last summer when economists at Riyadh's Jadwa Investments group projected that under current conditions Saudi Arabia by 2030 will be burning 6.5 million barrels a day and will have only 4.9 million available for export. Of course conditions will not remain the same: the Saudis are well aware of this grim projection and investing heavily to change the equation, pressing ahead with the solar and nuclear programs and exploring for natural gas even in the Red Sea, on the opposite side of the country from the traditional oil fields. Nevertheless, the kingdom's position as the indispensible global oil source is likely to diminish as outputs surge from other producers, including Iraq. At the same time, new drilling technologies have revolutionized the oil and gas industry in the United States, where oil output is surging and a glut of natural gas has raised the possibility of exporting it. The United States and Saudi Arabia have never had a formal defense agreement, but strategically they have been closely linked since the Truman administration. One pillar of their relationship was their shared opposition to the expansion of Soviet Communism, which is no longer a threat. The other was oil. Those ties too are changing. The United States remains committed to the security of Saudi Arabia, and the two countries are partners in the global struggle against al-Qaeda-style extremism. Saudi Arabia is an important market for American exports of technology, goods and services. But the era of mutual dependence may be drawing to a close. The Saudi foreign minister, Prince Saud al-Faisal, may have put it best when he quipped that Riyadh and Washington used to have a Catholic marriage - only one partner - but now they have a Muslim marriage. That requires new thinking, but in the end it may turn out to be best for both countries. Thomas W. Lippman, a former Middle East bureau chief for the Washington Post, is an award-winning journalist who has written about Middle Eastern affairs and American foreign policy for more than three decades. He is a former adjunct senior fellow of the Council on Foreign Relations and an adjunct scholar at the Middle East Institute in Washington. The author of five previously published books on the Middle East and diplomacy, Lippman has appeared frequently on national television and radio. He lives in Washington, D.C.